If you notice any of the items above it may mean that your foundation is settling, or you have pressure on the walls of your foundation from poorly compacted soil and water build-up around your foundation. Don’t panic when you see these signs, but do call the professionals at Atlas Piers. We can fix these problems before they become a really big issue. We take each job seriously, and we understand every foundation is different. We will find a solution for your commercial foundation repair needs in Hoover, AL, that fits your problem that will also fit your budget. We offer pressure grouting to fill voids beneath cracking concrete, underpinning to lift and support your home’s foundation or slab, carbon fiber repair to correct cracking, leaning, or bowing walls, and so much more. All of our products are high-quality Earth Contact Products that are built to be durable and dependable. 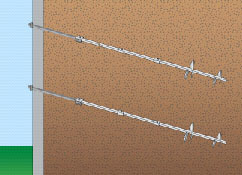 Our helical pier and resistance pier installation will correct any foundation sinking in your home. We have years of experience in the area of foundation repair. When we do underpinning for an existing building, we want to strengthen, stabilize and lift the foundation up to where the elevation once was. The helical piers and steel push piers are made by Earth Contact Products (ECP). ECP is recognized for making the best products for foundation repair. The piers are installed into the soils below your foundation. Now the weight of the load is transferred to these piers providing support and lifting your foundation back up to a better elevation. We really can help with any problems related to your foundation repair Hoover Alabama needs. So don’t delay when it comes to your foundation. If you have a damp or wet crawlspace, you may be in need of wall encapsulation services from Atlas Piers. This method involves installing a vapor barrier all along the interior of the crawlspace to prevent the moisture from seeping through the concrete and into your crawlspace. Damp crawlspaces can result in issues like mold growth, wood rot, metal rust, wet insulation, and high humidity; we can keep these problems at bay with our professional encapsulation services. We also offer crawlspace underpinning to fix structural issues in your crawlspace. Sinking and shifting crawlspace can be fixed by underpinning with foundation piers to offer support and stabilization to your home. Atlas Piers has all of the necessary solutions for your crawlspace problems. Make the call today and get on the road to fixing your foundation and protecting one of your largest investments; your business!